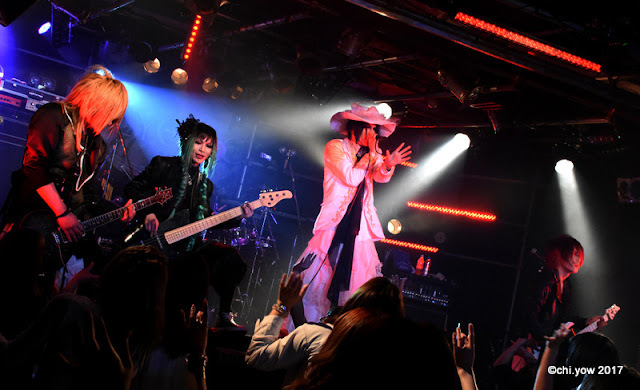 LIVE REPORT: HOLYCLOCK 「Shoukei to Renbin no Ryuuseigun」One-Man @ OSAKA RUIDO | VKH Press – J-Rock & Visual Kei Coverage Worldwide! HOLYCLOCK rocked out at OSAKA RUIDO on April 20th for their one-man “Shoukei to Renbin no Ryuuseigun” that served to introduce their identically-named single released the day prior to the live. As the first one-man concert for the year, HOLYCLOCK brought a slew of powerful as well as emotional songs for their audience to enjoy for the night. Breaking from tradition, the band revealed mid-live during a short interlude that their next one-man live for the year had already been decided for August 25th at Shinsaibashi BRONZE titled [Babel no Tou], the tour final for their single release commemorative tour [I.A.R.A]. Vocalist Ryuutarou also took time to connect better with the audience as bassist Yahiro unfortunately experienced some sound trouble with his amp mid-live. The vocalist easily drew laughter from fans as he jumped sporadically from serious topics to amusing stories that had happened in HOLYCLOCK’s history. Guitarists Kaoru and Takuya also improvised a playful mini jam session with help from support drummer KENZy. Once the problems had been resolved, HOLYCLOCK continued as if there had been no interruptions, the audience gamely falling back into pace, meeting aggressive songs with enthusiastic headbanging and fist-pumping and listening sedately to the calmer numbers. After an encore of two songs, HOLYCLOCK thanked their fans for their time before departing the stage.